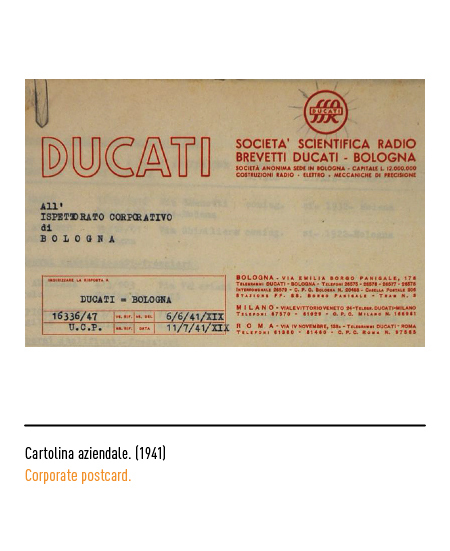 In 1924, the physics student Adriano Ducati became famous for succeeding in radio broadcasting from Italy to U.S with a short waves device he had built. 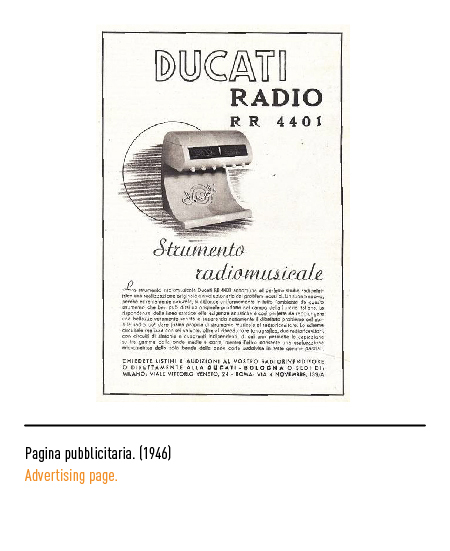 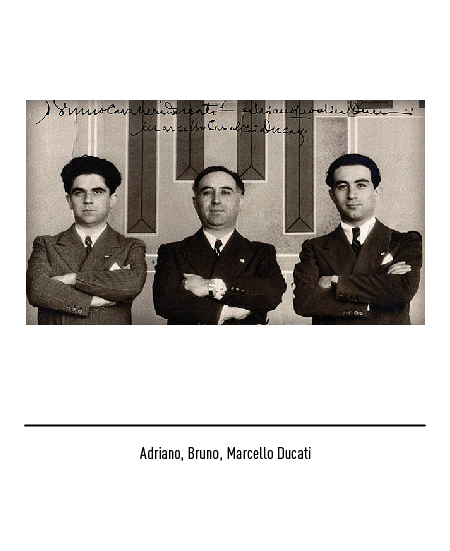 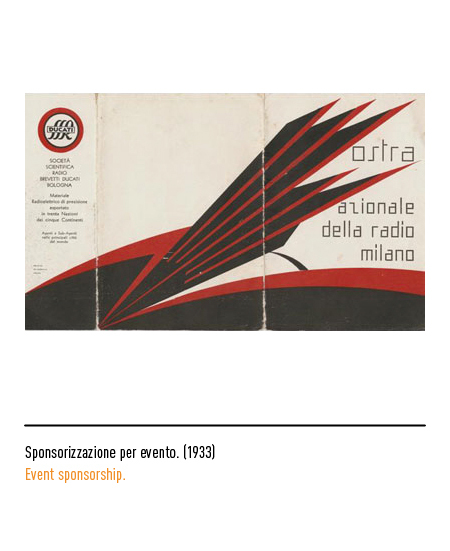 Pushed by his enthusiasm , he established in 1926 the "Societá Scientifica Radio Brevetti Ducati" (The Ducati Scientific Society for Radios and Patents) along with his brothers Bruno and Marcello, in order to supply hardware and manufacturing to the new born radio market. 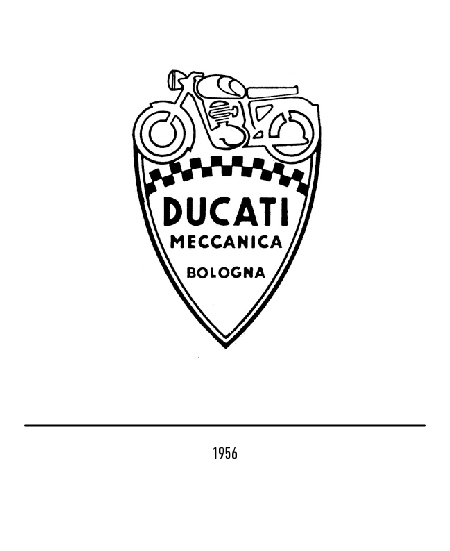 The first logo pictured two "S" who cross each other over standing a lightning, symbol of electricity; in the word "Ducati" the "V" substituted the "U", graphic feature of the fascist period. 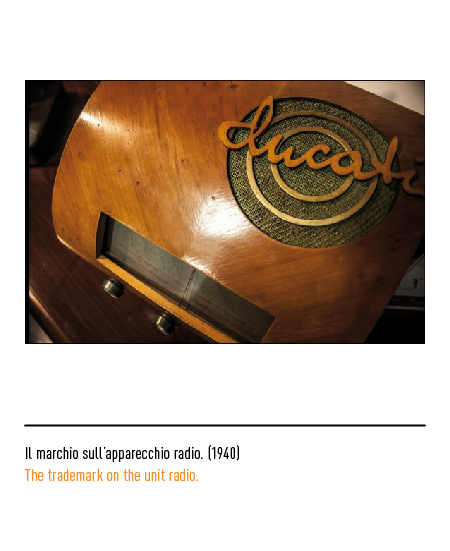 First limited to radio capacitors, the production rapidly expanded to radio devices and precision mechanics, also contributing to employment in such a strong and broad manner, to become the biggest and most important industrial landmark of the Thirties. 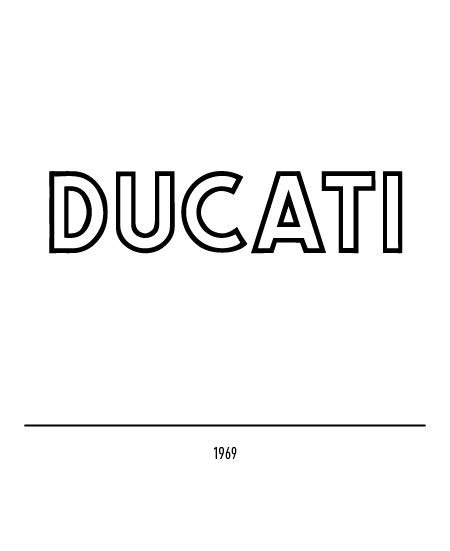 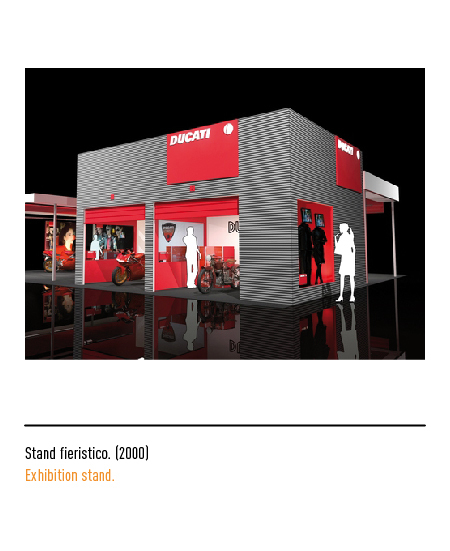 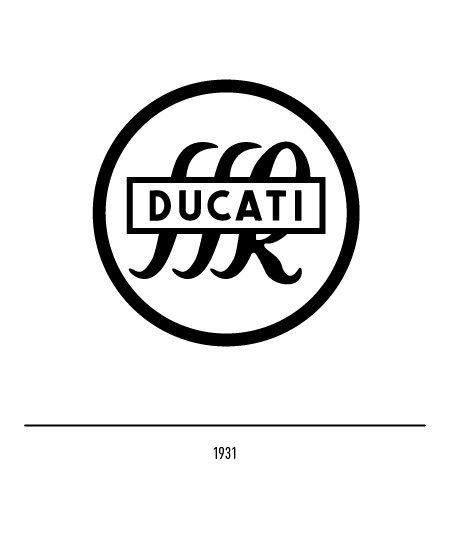 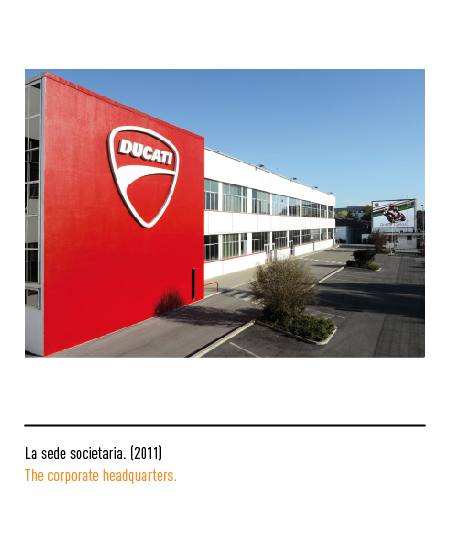 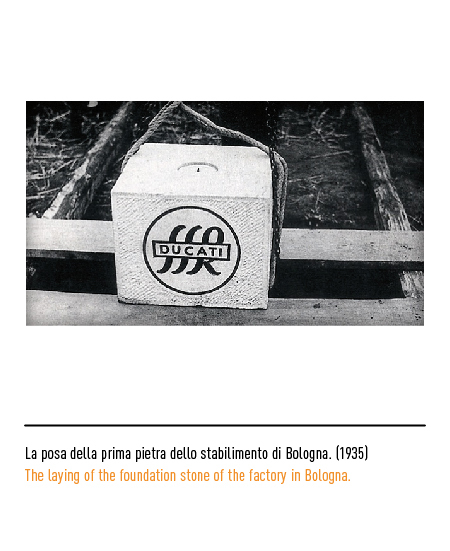 The expansion of the production, in 1931, inspires the owner to change their logo; a circle with the letters "SSR" and the word "Ducati" inside a rectangle. 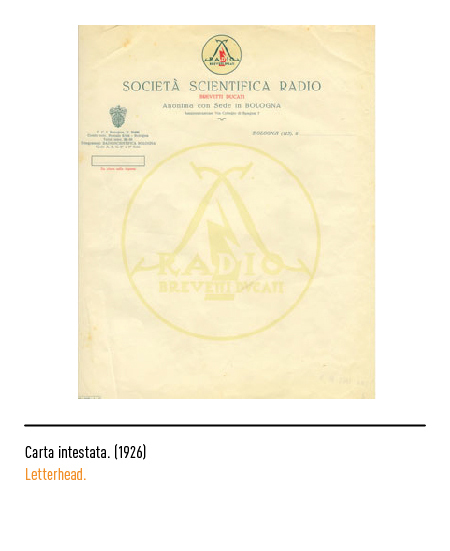 From the latter derives the typical logotype which appears in the communication and advertising of the company, in outline and capital letters. 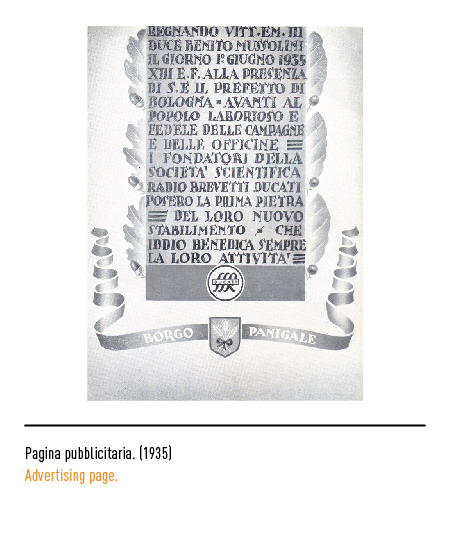 In absence of a graphical regulation, in 1940 the devices bore a calligraphic logotype, typical feature of the period. 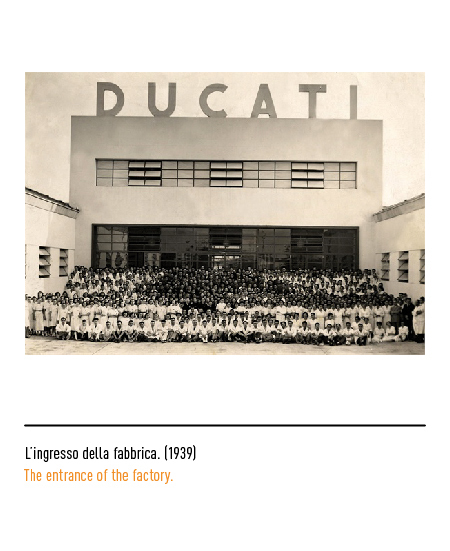 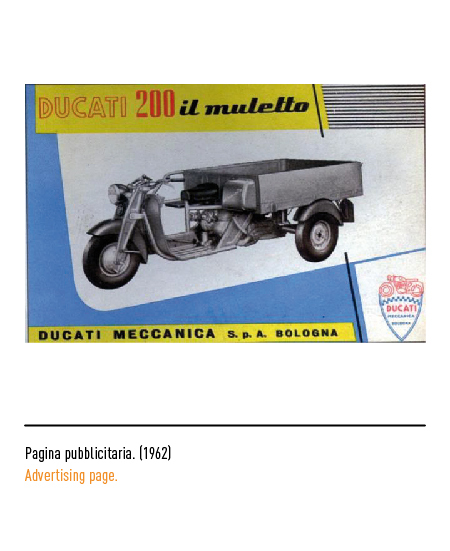 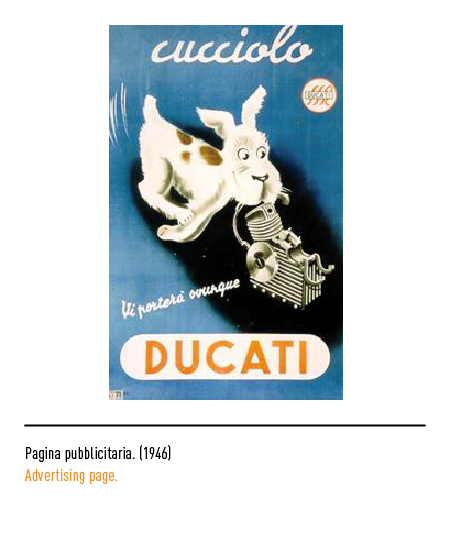 In 1944 the Factories were highly damaged due to the bombs dropped by the Allies army; in 1946 the factory was partially recovered, and the motorcycle "Cucciolo" was created, the first motorcycle to be produced in "Ducati". 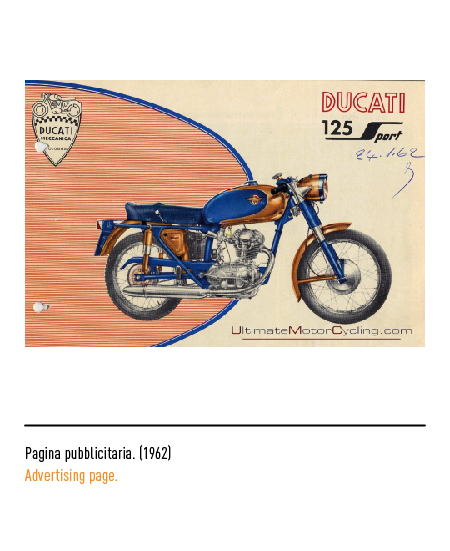 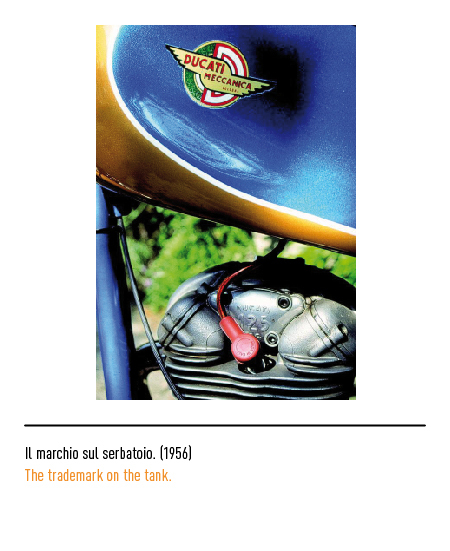 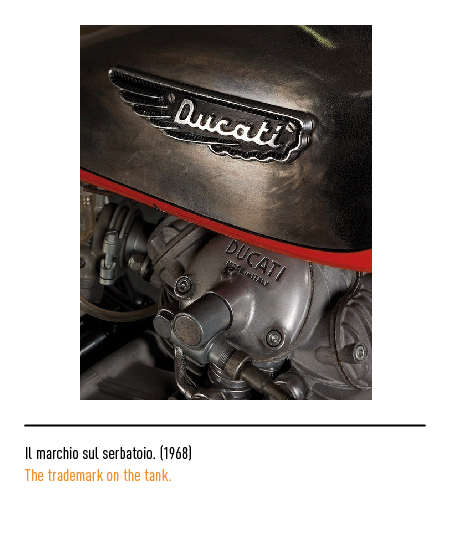 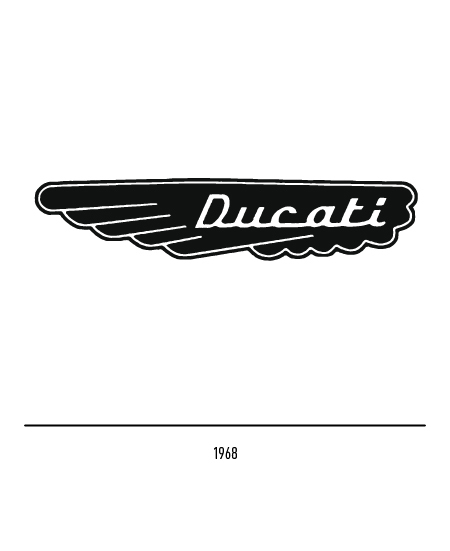 In 1949 the Ducati starts a full-blown production of motorcycles, revealing the issue of creating a logotype which should appear on the tank, featuring the name of the manufacturer. 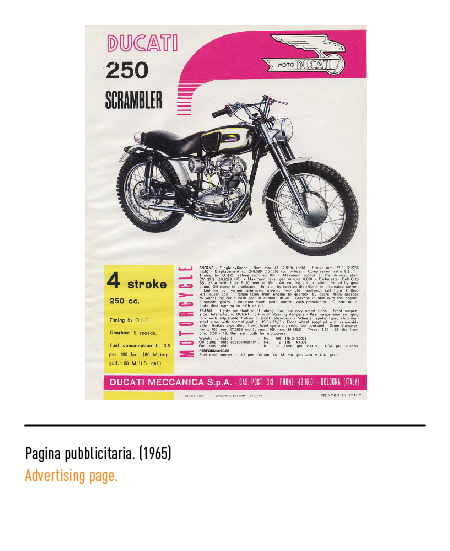 In 1956 the company is split in order to differentiate between electronics and motorcycles; the brand "SSR" is far too small to be seen and it represents mainly the electro-technic production. 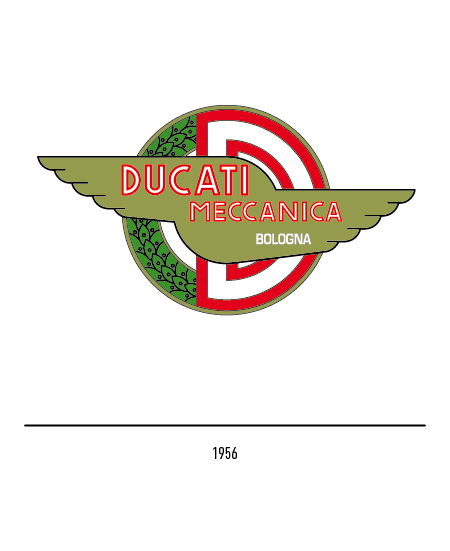 In 1956 a new logo appears on all the new motorcycles manufactured, consisting of a laurel wreath which ideally completes the "D" of the name and forms with it a circular figure; superimposed to it, a pair of wings on which once it read "Ducati Meccanica Bologna" (Ducati's Mechanics of Bologna). 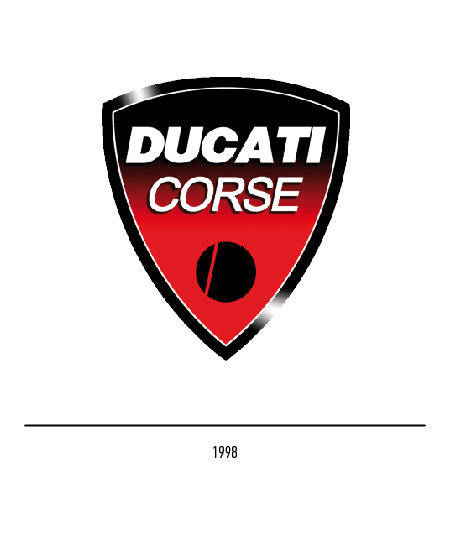 This logo was sided by another one picturing a motorcycle on the checkered line, typical feature of racing competition. 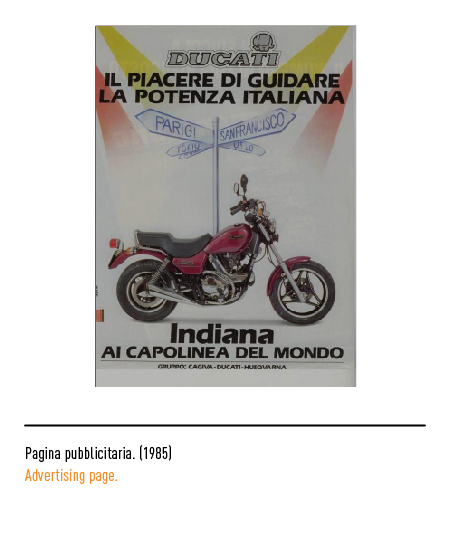 It was only found on the user's manual, to identify authorized retailers and on any advertisement which promoted the motorcycles. 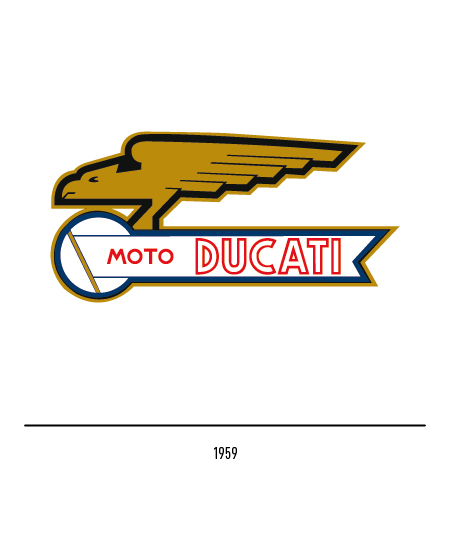 In 1959, almost as natural evolution of the pair of wings, a young eagle symbolizing freedom becomes the new logotype; such animal is represented as covered by a double pointed flag bearing the inscription "Moto Ducati", showing only the talons and the beak. In 1968, in order to answer accordingly to the movements of the moment, which were those of youth rebellion and "easy riders", Ducati switches to the typical black wing, simplified and soft, with Ducati typed in an unusual italic manner; it's the logo carried by the motorcycle which has been a landmark and an evergreen in the Ducati history, the Scrambler. 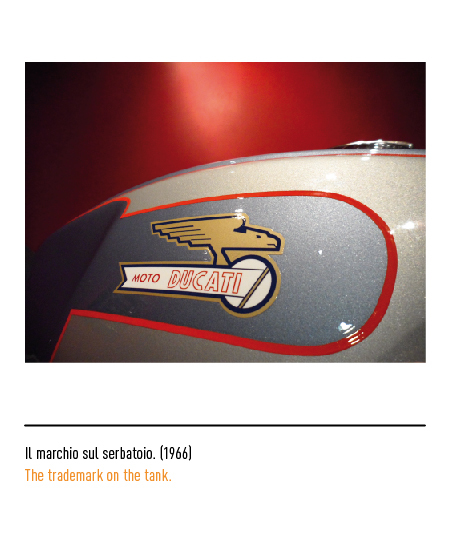 A little fact: this last logotype, was not and adhesive, but consisted of a metal plate screwed to the tank. 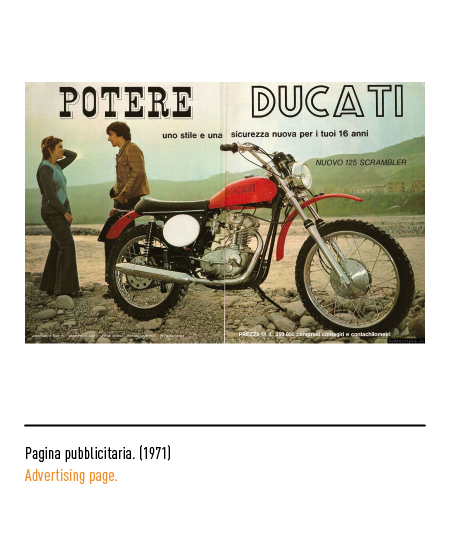 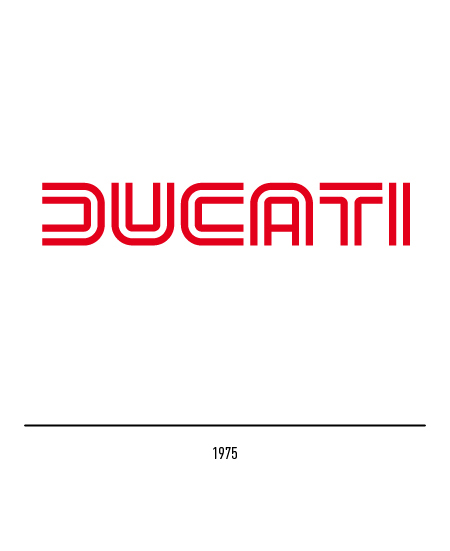 In 1969 the logotype with "Ducati" outlined in red appeared for the first time on the motorcycles, firstly on racing motorcycle, then on the whole production. 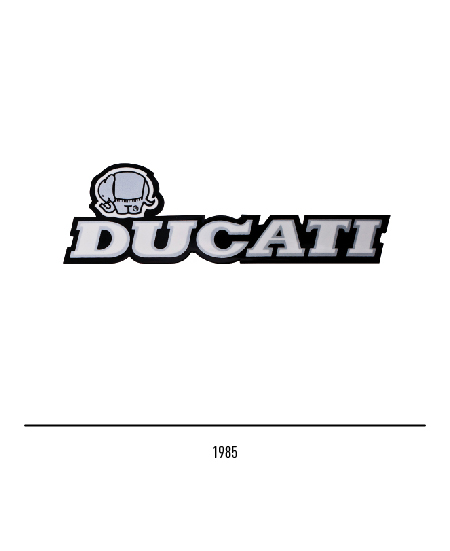 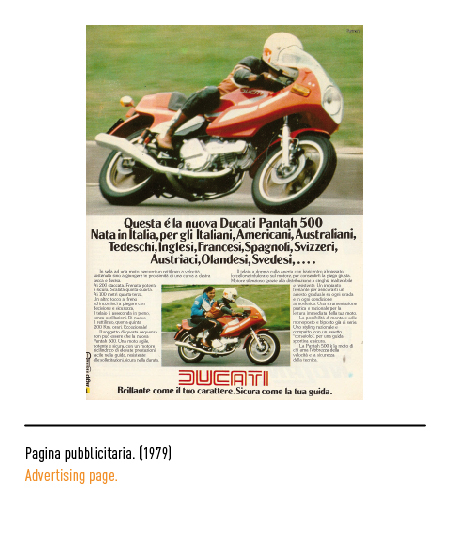 In 1975 Ducati decides to enter the world of design once and for all; to analyze some motorcycles designs and to come up with a new idea for the logo are the requests Ducati submits to the designer Giorgetto Giugiaro, who gladly accepts. 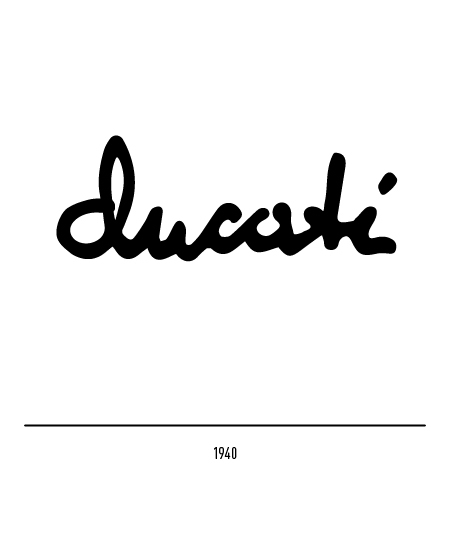 The logo is the name of the company written in a regular font made by double parallel lines. 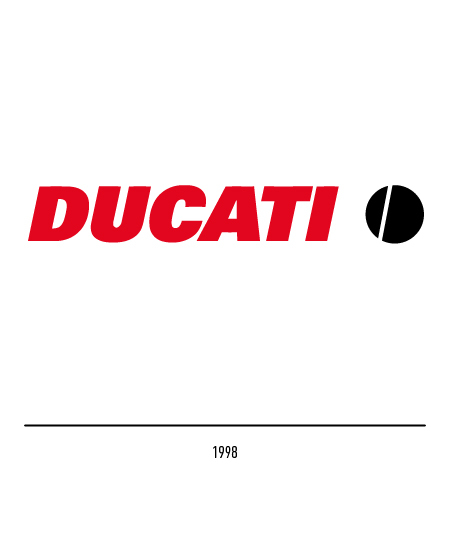 It will be used until 1985, year in which Cagiva acquires the company and decides to restyle the Ducati logo to give to it a Cagiva identity, through using the same font and the small elephant. 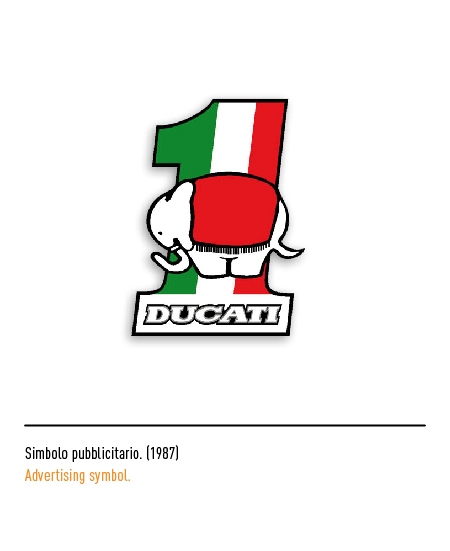 Aesthetically it's not really the best composition, reason why in 1993 the small elephant disappears. 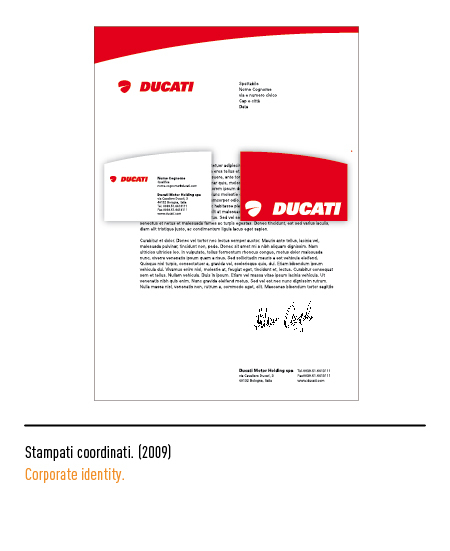 In 1998, a new design by Massimo Vignelli is submitted to the new U.S. management: the logotype in capital letters typed in Univers Italic, sided by a circle which has the looks of a simplified "D". 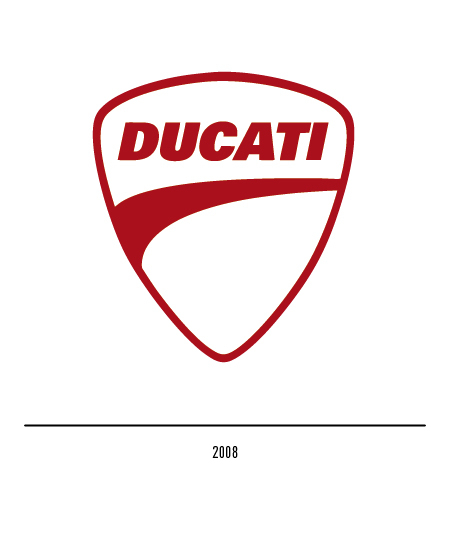 The Ducati enthusiasts, due to a failed understanding of the new simplified "D", ironically named the new logotype "chicco di caffé" (coffee bean). 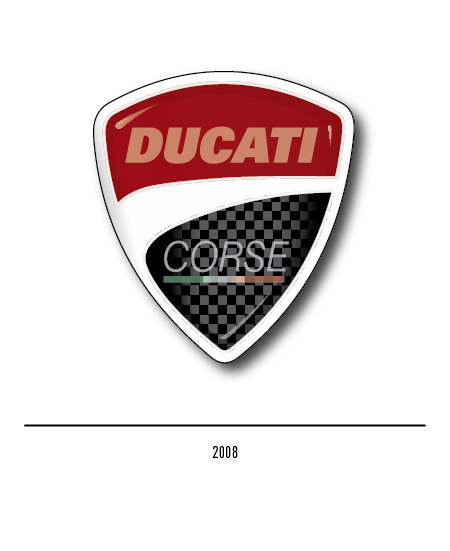 The logo to be shown on racing motorcycles was also submitted, a title with the elements of the identity. 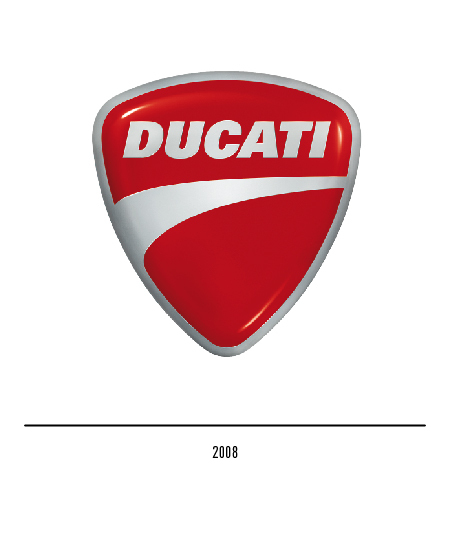 In 2008 the new logo is appointed to the studio Landor of Milano; the new logo celebrates the emotions of the curve, place and moment in which the Ducati can inspire powerful and wonderful feelings. 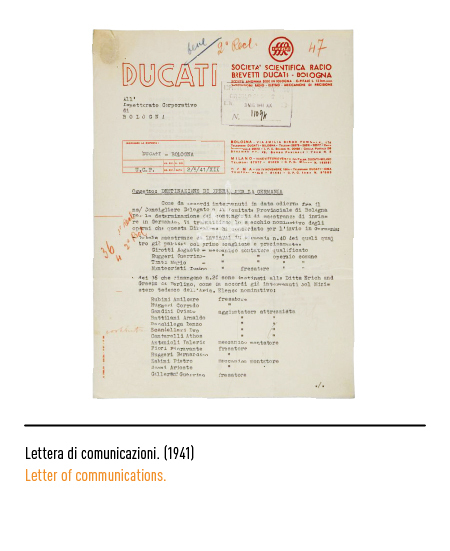 The curve is inscribed in a red title, symbol of victory and of the Italian passion for sports, and above it all, the classical Ducati logotype. 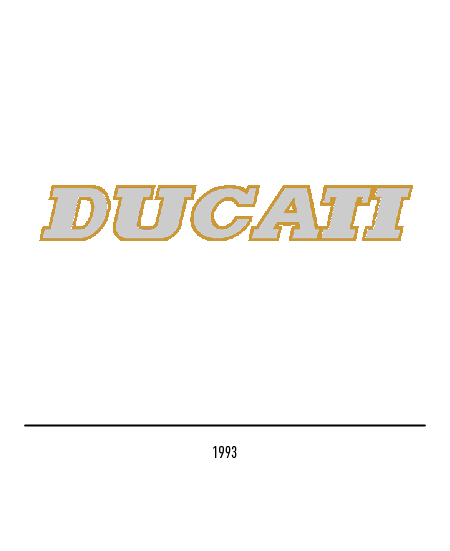 As in 1998, also the logotype for the racing section is changed. 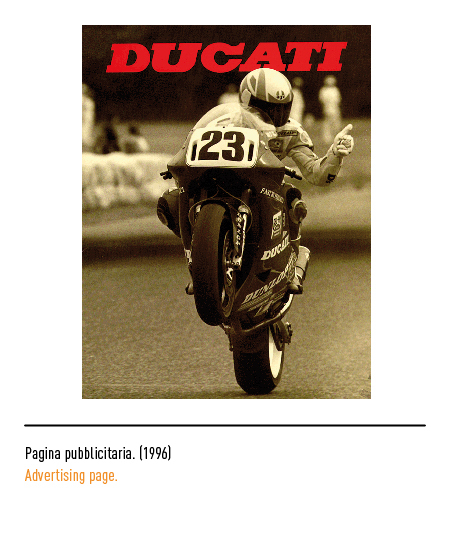 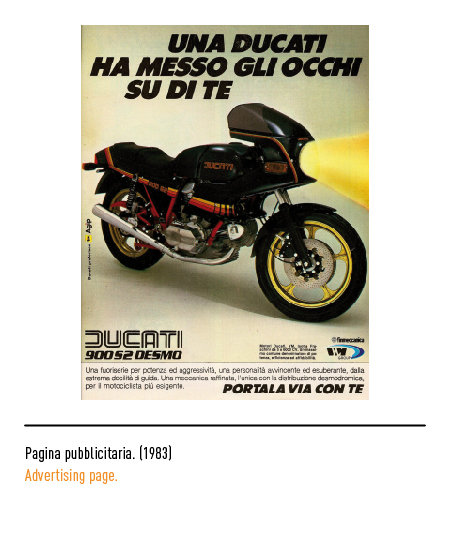 MOTO DI IERI E DI OGGI, a cura di Remo Trucchi, Mondadori Editore, 1991, Milano. 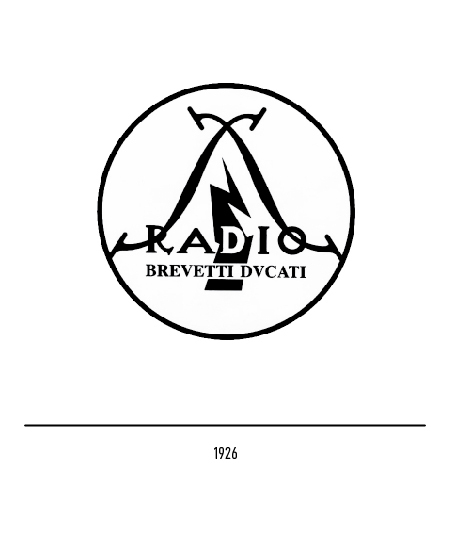 AAVV, MILLE RUOTE, Domus e De Agostini, 1975, Novara.